To use consistent versions of crucial operating data in systems across your organization, you need a central source of master data—which includes information about your customers, products, business units, locations, suppliers, partners, processes and policies. Master data appears in systems all over an organization in a variety of formats, structures and quality, and with a great deal of overlap and redundancy. MDM enables you to identify, scrub, store, govern and access your master data as a consistent resource. An effective MDM solution understands the endless relationships among master data elements. For example, an MDM knows that employees have roles and managers, that they are members of departments and divisions, and that those divisions have locations and associated customers—and the list of relationships goes on and on. Unfortunately, most legacy MDM systems are built on relational databases that can’t traverse these business relationships with dependable performance. As a result, relational MDM systems make it impossible to build agility and reliability into systems across your entire organization. To design an agile, dependable MDM solution, enterprise data architects need a data model that enables both production and ad hoc access, and adapts easily as business requirements and structures change. And that sort of power and flexibility is handled best by graph database technology. As the leading native graph database, Neo4j is ideal for modeling, storing and querying the hierarchies, metadata and connections in your master data. Neo4j’s flexible modeling approach saves you the prohibitive engineering costs required to build and maintain relational MDM solutions. Neo4j graph-based MDM solutions can connect data stored in existing CRM, ERP, supply chain, finance, point-of-sale and service systems to provide a consistent view of enterprise data—without requiring you to migrate all your master data into a single repository. When you transform traditional relational hierarchies into graph networks, you gain tremendous performance, flexibility, maintainability and agility as business needs change. 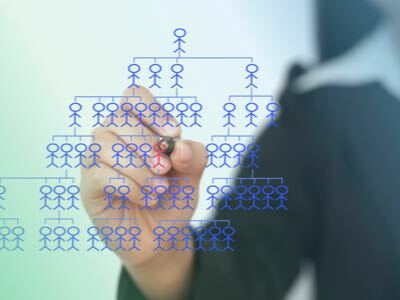 The advantages apply to all kinds of hierarchies including organization charts, product catalogs, bills of materials, document folders, sales territories, order systems, and customer-facing applications. A simple example of a master-data hierarchy is an organization chart. A small hierarchy is easy enough to model and maintain in a relational database. But as soon as we model a larger group of employees, querying and maintaining the hierarchical data becomes much more difficult and expensive. For example, every time an employee gets promoted, you must reset every one of the employee’s roles and relationships for every hierarchy in which the employee is a member. Neo4j’s graph-based approach simplifies the creation and maintenance of hierarchies, and preserves high performance even as your business organization and processes change over time. Using Neo4j, you can also make a 360° view of your master data to all your applications and users—either by managing all your master data inside a single repository or by creating a shared repository to support the next generation of customer- and partner-facing e-commerce, support, service, supply-chain and logistics systems. The best data-driven business decisions aren’t based on disjointed information silos. Instead, you need real-time master data with information about data relationships. As a native graph database, Neo4j is built from the ground up to support data relationships. With more efficient modeling and querying, organizing your master data in a graph yields relevant answers faster, more reliably and with more flexibility than ever before.